A few days after the Arkansas Scottish Festival I received a package from Jimmy Bell of Lyon College. It was a very nice looking piper of the day award! I wasn't expecting this at all and was proud to have the honor. This is my first piper of the day award. Wow, has it been nearly 3 months since my last post? Unfortunately, the food industry and weekend bagpipe competitions don't go together. 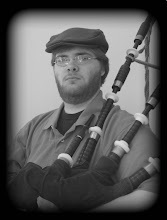 The break from competitive piping didn't do me any good, but I did put on a decent show in Arkansas. I was judged by Chris Apps for the first time and really enjoyed meeting him. The forecast was for thunderstorms and heavy rain all day. Thankfully, it only sprinkled here and there and held off during the solos. On the way back home was another story! On the "warm up" deck I began double thinking my tunes. I changed my 2/4 march from Dunoon Castle to Siege of Delhi. I contemplated the same for the strathspey/reel, but did not change it even though I really should have. Apparently I did not learn my lesson from Patrick back in September! My 6/8 is new, but I enjoy the tune so much I was confident in my ability to present it well. I know what I need to work on and look forward to competing this summer.